With support from the US Agency for International Development (USAID) Emerging Pandemic Threats program, the Southeast Asia One Health University Network (SEAOHUN) has promoted OH capacity-building based on a common, regional set of core knowledge, skills, attitudes and behaviors relevant to building successful OH professionals. These “OH Core Competencies” were designed by SEAOHUN faculty in partnership with University of Minnesota, Tufts University and Training Resources Group, Inc., and they have served as the basis for designing a robust framework for OH educational platforms for university training as well as career development programs. OH curriculum for students is one of the most important conditions to build a new generation with strong knowledge, ability to respond with emerging and re-emerging diseases. In Vietnam, the medical, public health and veterinary training program are gradually improved along with the development of science and technology. OH approach has been partly incorporated into their curriculum in different subjects. However, this curriculum has not met the needs of OH core competencies. Therefore, Vietnam needs building new subjects or strengthening the integration of OH modules into existing subjects. In recent years, we were implemented different activities for building the training program bases on OH approach, included review current curriculum, create framework, develop training materials, test the teaching tools and apply to the training programs. A total of 20 universities belong Vietnam One Health University (VOHUN) were reviewed all current training programs, based on 7 OH core competency modules, 8 OH technical modules. Utilizing this competency-based framework, VOHUN has created a portfolio of educational OH modules to more effectively teach these competencies to undergraduate and postgraduate students. This presentation will focus on key outcomes and achievements of VOHUN in transforming public health, veterinary and other health institutions and curricula across Vietnam. 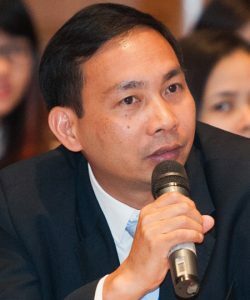 Pham-Duc PHUC holds a Medical Degree from Hanoi Medical University (1995) and a Master in International Health from the University of Copenhagen (2003). He got his PhD degree (2011) from the University of Basel – Swiss Tropical and Public Health Institute. Dr Phuc has been involved in many research projects on health risks related to water and sanitation, especially infectious diseases. Early 2012, he has joined Hanoi University of Public Health, Vietnam as a researcher where he conducts research in collaboration with staff and students. He has been developing and participating in different initiatives with national and international donors to generate funding for research and training on health risks assessment in water, environmental sanitation and food safety. He is a leader of the Center for Public Health and Ecosystem Research; and he also is coordinating the Vietnam One Health University Network since 2012.